[miau] I got the privilege of playing the Wizard of Oz Ruby Slippers game. I was amazed right off the bat at all the features it has to offer. There is the opportunity to get 4 wild reels, which they add, a 10x multiplier too. During the free spin feature, I was able to earn wilds and cash bonuses, also free extra spins. When you start out the game it looks like most others, there are 30 pay lines and it has a similar gaming site look and feel about it. This one is based on the famous movie that I just can’t get enough of. There is another game similar to it made by the WMS company, but this one is more of the elite version. This video game was just released to the online world, due in part to its success in the brick and mortar type casinos. One of the coolest features of the game is while the reels are spinning, there are two ruby red slippers clanking together. It kind of gives you a nostalgic feeling and makes you feel nostalgic and hopeful at the same time. During the bonus round, a little bubble will appear and anywhere from 1-4 wheels will be turned into wilds. This is the point where a multiplier is added that increases the values between 2-5x the winnings. To me no Wizard of Oz game would be complete without Glenda the Good Witch. If she happens to appear in a bonus section, the cash will be multiplies to 10 times the value. Don’t fret if you don’t get Glenda, I didn’t right off the bat either. However, I did get a couple features which instantly gave me cash prizes. During the “Find the Broom” feature, when this is triggered it means more cash and free spins. Another feature I liked was the Crystal Ball. This one occurs when two feature symbols is received with the Crystal Ball on the 5th reel of the game. There are cash prizes offered, but the stakes are much higher here, up to 200 times the winnings. What Wizard of Oz game would be complete without a trip to the Emerald City? In this game a trip to this place gives free spins. You can obtain this on both reels 1 and 4. Though I didn’t win big amounts of money on this game, I think the potential is there to do so. With the 10x multiplier and all the bonus rounds, it certainly is a game that has a visual appeal and has the ability to make some serious cash. 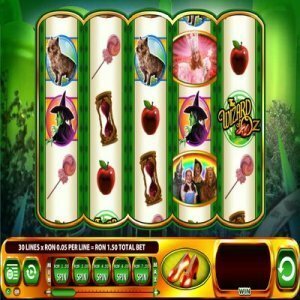 The player can choose the denomination they want to bet and the amount of reels they want to use. For me, this game was all about the stimulating graphics and the nostalgic feeling it gives from one of the best movies ever made.